A new line from Savvy?. Hehehe. These are advertised with an attitude and as I put this on, I felt it. I’m wearing the high-waisted option on the pants with the included cami on the right. When I was trapped at home Sunday night I got to playing around and took some photos. I guess I was still on a Noir kick. Yet more new stuff from Pixel Dolls. Weekend stuff comes after I have a chance to recover. The hummingbird shirt comes in an array of colors with the delicate design on both the front and the back. The jeans also come in a number of colors and because of the colors in the bird, pretty much everything goes with everything else. It’s really dark and dreary outside so I went for as colorful as I could. The stone pendant necklace is a 1-prim freebie. The shoes are Breakneck pumps in cherry from Shiny Things. Originally uploaded by SL Fashion Notes. This weekend Givenchi opened with a “Meet the Designers” theme with meeting a different designer who had a store on the Givenchi sim. I went during Miriel’s meet and greet. See my photos on Flickr with the tag mirielatgiveinchi. Yes, I know I misspelled it for the tag. Also I am still plagued by the grey goo and occasionally the Ruths. It’s the official closing of Relay for Life and the last chance to collect the goodies that have been created for this year. Just take a stroll around the walking track and pick them up on the way. These are just three of the many lovely windows lined along the track for L25 each. Hair from Calla, available in the Shopaholics store, skin by Gala available in the sim with the Zelda theme (sorry, wasn’t taking proper notes at 1am). T-shirt from the Pixels in Pink Noir City. Earrings from Sugar Punk, I didn’t see them on the route, please add a comment if you do. Necklace is Muse, again I haven’t seen it at the track. The cuff was made by Posy Trudeau, one last chorus of I didn’t see them, let me know if you did. It kind of scares me how good I am at ’50s looks. Stuff from PiP Noir City: hair by Zyrra Falcone (comes with and without broche), dress by Torrid Midnight, skin and eyes by Tete a Pied. Dress by Zyrra Falcone, comes with 2 skirt options. There is a lot more stuff at the Pixels in Pink city alone, also an amazing auction. *Makes mental note to check her bid* Go, spend, make this year’s Relay an even bigger success than last year’s. Mercury, the Haute Couture house that has tantalized the fashionista blogosphere for months, is now open for all those of you who have been eager to purchase the items you’ve seen in all the fashion blogs. I was late arriving, but it seemed more of a nice press conference than a grand opening. Now don’t think you’ll have these items around forever. The Whitfields plan to retire the current collection when they release the next one ideally in October. The photo features (L to R) Winfred and Wilhelmena Whitfield. I have more photos from the event on my flickr stream tagged with mercurygrandopening, but I warn you I was plagued by the Grey Goo and Ruths this morning. 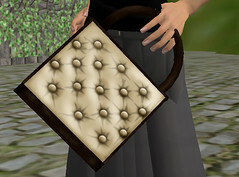 You are currently viewing the archives for July, 2007 at SL Fashion Notes.